Twitter, one of the hottest social networking tools which created communities via 140 character lines looks like to become a favorite for the wearable electronic community as well. A few short years ago, we all where happily writing lots of emails to our friends, then came Facebook to link up and expand our network. With the growing number of friends, email writing is taking too long so Twitter saves our day now by cutting our communication down to 140 characters. The next evolution might be to let our clothing make the tweeting to free our hands for more important tasks. Our clothing is always with us, it knows what we are doing and smart fabrics will do the tweeting for us. Twitter fashion ideas like the TweetShirt by Stef Verheijen show the tweets via a textile display on the chest of a T-Shirt creating a dynamic pattern on the shirt and show the social network activity of the wearer. Another twittering clothing item is the Rumbler, developed by Ricardo Nascimento and Tiago Martins. Rambler is a pair of sneakers embedded with a sensor that detects when the wearer is walking. Every step taken is tweeted as the word ‘tap’ or symbol ‘.’ depending on the pressure of each step and sent via Bluetooth to a mobile phone which uploads the tweets to Twitter. Follow me in the purest sense. 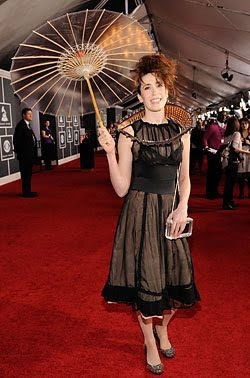 At the 52nd Grammy Awards, British songstress Imogen Heap brought live twitting to the red carpet by wearing a Twitter Dress. The technology part of the dress is designed by Moritz Waldemeyer. The Twitter Dress sends tweets and receive tweets via an iPod Touch inside the Fendi bag. 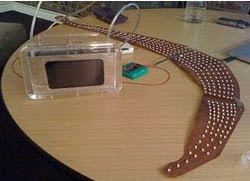 The text is sent to the necklace, displaying the message and the Twitter pictures are displayed on the iPod Touch screen which is visible from the outside through the transparent material of the bag. No matter how playful or ‘out-of-this-world’ these concepts might look to you, clothing and the use of it to express personal interests and the association to Universities, brands, beliefs has been used since humans use clothing. Yesterday we used printing or embroidery techniques to mark our clothing and show the association. Today we use 21st century know-how and technologies to establish the link between our clothing and the social networks we identify ourselves.